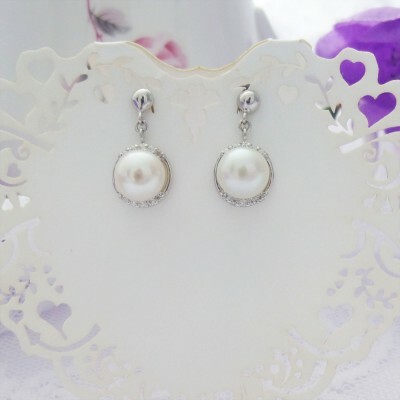 These pretty earings feature an ivory pink round freshwater pearl set in a sterling silver surround with tiny inset cubic zirconia stones to the top and bottom. 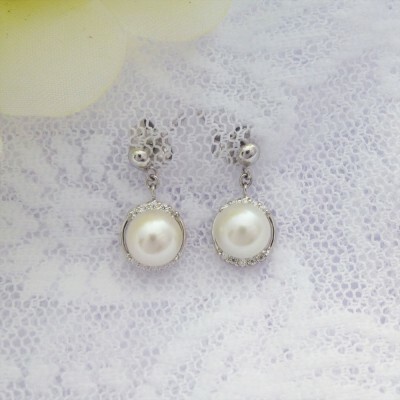 Very dainty and elegant, these pretty earrings are ideal for bridemaids with a pushback stud fastener. The main feature is the round freshwater pearl in ivory with hints of pink, a beautiful stone and very popular for weddings. There are four tiny CZ stones in two rows at the top and bottom of the clasp that holds the pearls. A two ring chain then leads to the pushback stud fastener. 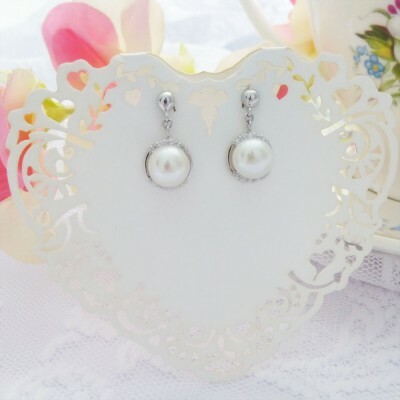 These pretty earrings are perfect where you need to have understated ellegance, perfect for weddings and balls, very popular for ladies looking for a classical look and a timeless set. The earrings weigh 2.4g and are omfortable to wear for long periods. 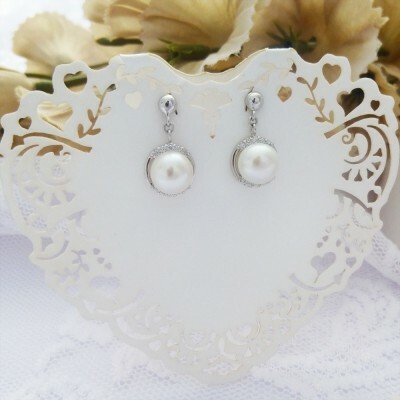 The length of the drop is 16mm and they are made with 925 sterling silver that has been hallmarked in the UK, the hallmark is on the back of the pearl clasp. 2.4g freshawater pearl drop earrings. Hallmarked 925 highly polished sterling silver clasp. Pushback stud fitting, ideal for weddings.